Last week saw our series on Fluid intake during exercise, where we described the development of our perceptions around drinking during exercise. We looked at how there has been a radical shift in perceptions since the 1970's and how the current scientific evidence is beginning to swing that perception around again. Where it was once recommended that you drink, drink, and drink because thirst was not good enough, there are now studies showing that excessive drinking can be deadly, and that when drinking to thirst the body loses some weight without any risk or detriment to performance. And when we started The Science of Sport, our intention was always to stimulate debate, to encourage discerning readers to comment, submit questions and discuss the topics we present. So on that note, today we thought we would share the comments of a doctor, which were kindly sent via one of our readers. So below, highlighted in blue, are the comments of the doctor, word for word as he submitted them, without any corrections from our side. We then have attempted to address his points in a logical manner and using evidence from the scientific literature. "why do you feel bad when your [sic] in the heat for a long period of time. it is not because your osmolality is off (that is the balance of electrolytes, etc) it is because of "volume loss." Having worked in the medical tents of the Two Oceans and Comrades Marathons for the past three years, studying this exact question, it is now evident that 99% of the runners finish without any undue symptoms and have lost the same amount of fluid as those who enter the tent. In 2005 at the Comrades Marathon, we found that "Control" subjects who did not report to the medical tent had lost the same amount of weight as those who did report to the medical tent. So clearly, their collapse was not a volume issue, or surely all the athletes who lost similar amounts of weight (i.e. volume) should then collapse. This study is currently in press in the Clinical Journal of Sports Medicine. In addition, no study has ever demonstrated that volume loss is responsible for any raised perception or medical condition during exercise---and again, we cannot stress how critical this is - you cannot study humans outside of exercise and apply the same findings. "what happens when you reduce the volume of a closed system such as your blood stream. your blood pressure drops. perfusion to muscles, brain, gut and other vital organs begin to shut down. you become dizzy, faint, pass out and seize." In 1979, Ethan Nadel published a study (Journal of Applied Physiology) where he compared exercise in the heat to exercise in the cold, specifically to look at the circulatory system. In that paper, he showed that the challenge to the circulation as a result of plasma volume contraction was more than adequately met by a redistribution of blood from the splanchnic, renal and gastro-intestinal circulatory systems. Is there a challenge to the circulation whenever plasma volume is reduced (be it high temperatures or fluid loss)? Yes, but the body is more than capable of adjusting to this 'stress'. A number of other studies by scientists in Denmark particularly (Savard, Nielsen, Nybo) confirmed this for exercise in the heat. There is no evidence that perfusion to the vital organs of the brain, muscle or skin is compromised during exercise, unless you become significantly volume depleted. However, the point we are making, a point borne out by the evidence, is that drinking to thirst is well capable of preventing that kind of fluid loss. If you drink to thirst, you'll never lose enough body water to reach this scenario. Instead, what the doctor refers to is likely to happen only in patients with severe medical conditions, including haemorrhaging or being lost in the desert for a week. "blood pressure drops. perfusion to muscles, brain, gut and other vital organs begin to shut down. you become dizzy, faint, pass out and seize...BP drops. he starts getting dizzy, nauseated. he is trying to keep standing. BP to brain continues to drop because the heart has no volume to pump to the brain "
We need to be very clear about the point that people collapse after finishing, not while they are still running. This is critical, for it suggests that it is the act of stopping running that causes the drop in blood pressure. This point, which we made in a post about the Chicago marathon, indicates that the blood pressure is more than adequately defended during activity, but once some athletes stop, the removal of the muscle pump means the blood pressure suddenly drops as they are not able to mount a sufficient compensatory response to this fall in venous return. Note that this has nothing at all to do with the fluid loss, as the doctor purports. Instead, it's entirely the cause of a reduction in venous return by what is often called "the second heart," the muscles pumping blood as they contract. The Frank-Starling law of the heart, of which the doctor is no doubt aware, then says that as venous return falls, the cardiac output is reduced, and in the presence of vasodilation (as occurs during exercise) the result is a fall in the blood pressure. This phenomenon was described in the mid-90's in a series of papers by Holtzhausen and others, which you can find here and here. The point is that it's not the volume reduction, but the decrease in venous return in the presence of sympathetically-driven vasodilation which then fails to reverse quickly enough. For this reason, the best method of treating the collapsed runner is to allow him to lie with his feet elevated for a short time. Of course, there are more serious collapses, but you'll find that these happen on the course, during running, and not when the athlete stops running. It should be noted also that the presence of seizures must indicate some degree of encephalopathy which has not been shown to be associated with any amount of weight losses in otherwise healthy adults. Finally, we'd also like to point out to this doctor that the athletes who lose the most fluid during marathons tend to be the elite athletes and race winners. An elite athlete drinks probably 200 to 400 ml/hour on average (a generalisation, but one backed up by evidence and our direct knowledge of elite athletes' drinking patterns). Yet in order to run at 3 min/km for 2 hours, the athlete would have a sweat rate of anything between 700 and 2000ml/hour, depending on environmental conditions. This drinking pattern will always result in body weight losses, often as large as 4%. A 60kg athlete, for example, who drinks 400ml/hour, with a sweat rate of 700ml/hour is expected to lose about 1.5% of body weight. On a slightly warmer day, this increases. Yet these athletes do not slow down, and only very rarely do they collapse. That is a paradox of the model that the doctor proposes---that is, if weight and volume losses are so detrimental then it must be the athletes who lose the most weight and volume that suffer the worst symptoms. We are interested to know the explanation for this observation, as well as the earlier mentioned fact that 99% of the field who do not need medical attention have lost as much weight as the 1% who do. To us, it suggests something else is the cause. "these guys are idiots and definitely have an "issue" with the sports drink companies." "somebody needs to write these clowns and challenge their thinking"
As we mentioned in the beginning of this post, we encourage further discussion around these and any of the points we make here. Knowledge and scientific "truths" are an evolving entity, and expected to change as new evidence becomes available. Therefore we are disappointed that this doctor did not feel he could post his questions and observations here on The Science of Sport, for we welcome debate and challenges to our interpretation(s) of the scientific data. We are also curious why this doctor used the terms "clowns" and "idiots" to describe us, as we have tried to present the scientific evidence and our interpretation of it in a way in which many people can access it. Whether there is a basis for teaching running as an activity, as opposed to letting "natural" technique evolve? Whether running techniques like Pose are marketed as medical products? Trying to make radical, wholesale changes to running technique is probably not the optimal way to go, for it simply transfers the point of loading on the skeleton to another area. Specifically, the research study discussed in Part III of the series (a study we were both involved in at UCT) found that 2 weeks of training caused the loading on the knee to be reduced, but the loading on the ankle increased. Well, that heading is a little misleading, the study was there all along, but it was only thanks to Doug, one of our readers, that we actually discovered it. And today's post is a brief summary of this study, the abstract of which can be accessed here. The only other study we were aware of was the one done at UCT in 2002 and published in Medicine and Science in Sports and Exercise in 2004. This study is discussed in detail in Part III of our series, but basically, it found that two weeks of Pose Training could alter biomechanics, the main changes being that the eccentric work on the knee was reduced, but the eccentric work on the ankle was increased. This study is referenced on the Pose website as support for the benefits of the technique. The problem is that the eccentric work on the ankle does, in theory, increase risk of Achilles tendon injuries and calf muscle problems. And until now, that was the only study of which we were aware. So this study was done sometime before 2005 (the publication was in 2005 in Journal of Sports Sciences). It took 8 triathletes, and had them do 12 weeks of Pose Training (a substantial increase on the training time from the UCT study), while another 8 triathletes kept up their normal running technique. Before and after the 12 week training period, the triathletes were tested for kinematics (things like stride rate, length etc.) and for running economy (oxygen cost at a given running speed). The speeds they evaluated were 4:40/km and 4:00/km. So the first two panels, showing that Pose training decreased stride length and vertical oscillation, are no surprise - the same was found in the UCT study. The reasons for the shorter stride in the Pose technique were explained in Part II of our series, and basically has to do with the fact that the runner is not taught to drive the knee forward, but rather the pull the foot up with the hamstring. The natural consequence of this is a shorter stride, but a higher stride rate (since the speed has to be the same). But the far right panel is most interesting. It shows that the oxygen cost of running was HIGHER after Pose Training - the running economy was thus reduced. What is the big deal with running economy? Well, it's one of the variables that often gets cited as being critical for running success. Generally, the best runners have the highest running economy (that is, lowest Oxygen cost of running at a given speed) - that's a gross oversimplification, but basically, the running economy is a measure of how effectively the athlete is able to use oxygen during running. Training improves running economy quite substantially, and all other things being equal (which of course, they never are! ), running economy is one of the keys to success. Therefore an increase in running economy is bad - any athlete aspires to go the other way, and reduce their oxygen cost of running at a certain speed. So this is not good news for Pose running. Not surprisingly, this particular study was never quoted on their website, and instead, only the UCT one is referenced (though even that is a dubious study because of the implications of the ankle work increasing!). The problem with the study - did people learn the technique properly? So now you have a debate - is this study (and the UCT one) to be believed as evidence against Pose? Of course, opinion will be split around that one, but one thing that one has to recognize is that many will say that the training period is insufficient to produce the necessary adaptations. In otherwords, one might argue that in the research studies, the time period over which the technique was taught is insufficient. This was something that many people wrote in and said in the earlier series. They suggested that if there were problems, it was because people had not learned the technique yet. That certainly might be an issue in the UCT study, where athletes learned the technique over a two week period. The problem is, the second study did it over 12 weeks. And further, I would argue that even the UCT study benefitted from guidance and expert supervision that is far beyond what most members of the public will ever receive through trying to learn Pose. This is even more the case in the second study, where for 12 weeks, athletes were given the very best advice and supervision. Yet still, Pose failed to show improvements. Now, any guesses for what might happen over a 2 day period, where you're one of perhaps 50 athletes, getting maybe 5 minutes of individual attention. This study is an interesting one because it evaluates Pose from the other direction - having previously looked at injuries and kinetics, this looks at running economy, a basic but important variable. And Pose running does not, unfortunately, move it in the right direction. This adds then to the argument that a wholesale change in running technique is unlikely to be the solution for most people, and we can only repeat the assertion from our series that says look at smaller changes, practical things and allow running technique to develop consciously, but not controlled. The last few weeks have been dominated by the aftermath of the Chicago Marathon. First we ran a series looking at the post-race media coverage, and the conception that dehydration was mainly to blame for the medical problems experienced by 1% of the field (an incredibly small number, when you think about it!). This fed into our latest series on Fluid Intake during running, which looked at the misconception that any level of dehydration is bad for performance and temperature, and that thirst is a bad guide to your fluid needs. Well, our attention now turns towards the next big city marathon - New York. We've already run a short, "news" post on the main contenders for the race (which you can read below). And in the days ahead, we'll build up more, looking at the likely contenders, tactics and so forth. And then as an aside, I was trawling through some discussion forums where our series on Fluid Intake was discussed. For the most part (I'm relieved to say), people discuss the concepts openly and with interest, which was always our intention. We believe that we've presented the facts accurately and correctly, but as scientists, we recognize that knowledge is constantly evoloving. So we'd be foolish to state with 100% conviction that what we say is correct and will be for the next 100 years! Because science is meant to evolve - there's a saying that "50% of what we know is wrong. The problem is, we don't know which 50% it is!". So here at the Science of Sport, our goal is to present the facts as they ARE currently. And of course it's our interpretation, but we encourage people to read the arguments and then make up their own mind - apply your minds, listen to people with authority and WITHOUT incentives (that is, people who are selling a product based on "science"). And we firmly believe there are times when only one conclusion is correct - the fluid intake story is one such case. I was amazed at these perceptions. To deal with the first one, because one is presenting information in a blog, does not mean the accuracy of the data is any less relevant. If we spent $10 a month converting the site to a proper website, would the content suddenly gain meaning? I (Ross) also have marketing management qualification and do part-time work in management of sponsorships and marketing around sports properties. And the HUGE gulf that is immediately obvious to me as a result of marketing is the gulf between the creation of knowledge and its translation and interpretation for 'non-scientists'. There is a need for information that is not being adequately met - this is a marketing gap. Just as I would request an accountant or financial analyst to help me understand Wall Street figures, stock profiles, P:E ratios and liquidity reports in income statements, so too would people require the same service when it comes to analysing and using knowlege to improve and understand sports performance. It is my experience that in every profession, there are those who hold onto their expertise as a weapon, lording it over those who do not possess the access or desire to search out the answers from first principles. And to suggest that we restrict ourselves to publishing in science journals only misses the point by a considerable distance. Our goal is to publish data, find published data from others, and then bring it forward to grow science. Any other approach belongs in an ivory tower. So our objective is to translate that information (all of which is published, by the way, though not just by us) and then make it available in an easy-to-read, entertaining manner. This is done without compromising the integrity of the information presented, and when occasionally we do succeed at stimulating debate, then we've certainly achieved something. So that's our mission - to make science accessible, to comment on sports news and bring you insight that goes beyond what you'd read in the local paper, and to stimulate debate. If you'd like scientific journals that do that, well, keep searching! Join us for the week ahead!! The Men's Race - Lel vs. Rop vs. any new contenders? Notably absent is Paul Tergat, 2005 winner and 3rd in 2006. But the presence of Martin Lel, who I (Ross) feel is one of the great current marathon runners is a massive drawcard for NYC. Lel won London earlier this year (his second London title, a sequence that has seen him go 1st, 2nd, 1st in arguably the world's most competitive race), winning a final 400m kick against a group of other athletes. He's a former 21km world champ, has speed to burn, and one of the great runners of the last five years. He is also in great form, winning last month's Great North Run in 60:10, so the signs are there that Lel is the man to beat in NYC. He hasn't quite achieved the status of his Kenyan predecessor, but a win in New York, to go alongside London (and a win in New York in 2003) would certainly cement his position. After seeing that race in London earlier this year, Lel was my pick to break the then-world record of Tergat. As we know, Gebrselassie did that in Berlin, and New York is unlikely to throw up any world records, but Lel is certainly our favourite for the men's race. Women's field - Radcliffe returns! What can Radcliffe do against a stellar women's field? Paula Radcliffe's return to the distance after having her baby. And then thrown into the mix, you have Ndereba, who has been in great condition, and Gete Wami, who apparently took Berlin relatively easy in an attempt to save herself for this race. But it is Radclifee who is likely to garner much of the media attention leading up to the race. Radcliffe has shown in the past she has the strength and speed to beat them both in the marathon, but her form after childbirth is an unknown at this point. She made her comeback last month in the Great North Run, and was beaten into second by a remarkable performance by Kara Goucher. But Radcliffe still ran 67:53, a time that is a minute outside her PB for the distance (though she has run 2 minutes faster, but it was unratified). So that is certainly an encouraging comeback, and with 6 weeks between that race and NYC, there's a good chance she is at least approaching the sort of form she'll need. A lot depends on the sort of training she was doing before the Great North Run. If that 67:53 performance was built off a really big mileage base, with limited speed work, then watch out! Because the marathon distance will probably not pose too many untoward challenges. If however her North Run performance was achieved with high emphasis on speed and little volume, then to build up to the marathon in 6 weeks is a very tough ask, and she may be found wanting at about 35 km, where Ndereba, Prokopcuka and the like will seek to drive home their advantage. As for her tactics, it will be fascinating to see how she goes about the race. Her famed front-running tactics may not be the best way to go in this race, rather sit in and wait for the shake up in the final 5 or 6 km, when there are sure to be moves. But more than likely, she'll go out hard, so watch for an early fast pace by Radcliffe as she might try to run the others off her heels and break them early. Whatever happens, there can have been few women's marathons as competitive and deep as this one. It should be a great race! Join us later in the week for more build up to the race! We really hope everyone is enjoying this series so far. It is proving fun and challenging to write, and we hope that is coming across in the posts. So far we investigated the history of fluid ingestion in Part I, demonstrated why it is the metabolic rate that predicts temperature in Part II, and weighed up the strengths and weaknesses of the lab-based and field studies in Part III. For Part IV we will look at the thirst mechanism and why waiting until you are thirsty is not "too late. "Myth busting: If you wait until you are thirsty, it is too lateHow often have you heard this? This is an oft stated mantra of athletes, coaches, and arm-chair quarterbacks everywhere. But where did this concept originate? In 1965 John Greenleaf did a study on four well-trained men to examine how much water they would ingest during exercise in the heat. The title was "Voluntary dehydration in man," and is the first reference to the finding that when given ad libitum access to fluids---that is, when we drink to thirst---humans do not replace 100% of their weight losses. For those of you who have read Part II and Part III, this should be no surprise, since in those posts we introduced the concept that weight is not the regulated variable, and therefore your body does not care how much weight you lose during exercise. This "thirst is bad" guide stuck, however, and some time later you were introduced to the mantra above: "If you wait until you are thirsty, it is too late." What is it too late for?The argument is that by waiting until you are thirsty, you are already dehydrated. This argument has been perpetuated because you have been led to believe that weight losses equal body water losses. However, even in a class lab we performed recently, our volunteer cycled for just over two hours. During that time he burned nearly 300 g of carbohydrate and fat while ingesting water ad libitum. His weight losses, or "dehydration," were 1 kg. Yet a whole 30% of that "dehydration" was not water at all and instead represented fuel that he burned. Let us say that again---the weight loss method overestimated his "dehydration" by 30%. So the take home message here is that the body weight losses grossly overestimate the fluid losses, and when someone is said to have lost 4% of his or her body weight, at least 10% of that or more will be fuel that has been burned during the exercise. The reality of the situation is that humans (and mammals) have very well-developed and successful mechanisms in place to help conserve and maintain their fluid balance, although the sports drinks companies have informed you otherwise. As we have said, the body is not concerned about body weight, but rather the concentration of the body fluids---otherwise known as the osmolality, and here is how it works. Incredibly small increases (1%) above the resting value (280-300) first will trigger the release of anti-diuretic hormone, or ADH. Its job is to keep you from losing any more water in the urine. It has a profound effect so that even small amounts of ADH produce a maximal effect---that is, it is not possible for you to produce any less urine. Next, if ADH does not do the trick, as is the case when you are exercising and sweating, your thirst kicks in. Again, this occurs at a very marginal (4% or less) elevation of the osmolality. The effect is that we seek fluid, drink, and some time later the fluid gets in to the blood and dilutes it back down below the thirst threshold. This cycle continues indefinitely until you stop excreting fluid (i.e., sweating) and restore your osmolality once and for all. The osmolality can decrease outside the cells. If this happens, then fluid will move into the cells. Similarly, the body will initiate a sequence of responses, including the release of other hormones (aldosterone, for example) that we won't go into here. As our bodies are mostly water, you can imagine why keeping these fluid volumes balanced is so important, and that is precisely why the body defends the osmolality and not the body weight. Yes, it certainly does, and that is because it does contain some sodium. However it contains profoundly less than the fluids in your body, and is still mostly water---body fluids have a sodium concentration of 140mM while sweat has a value of 20-60mM. Therefore when you remove a liter of sweat from your blood, it has much more of an effect on the volume compared to the solutes (sodium), and what happens is that the osmolality rises in response to sweat losses. This is absolutely crucial to realise - you cannot lose sodium, even if you are a "salty sweater", as Gatorade are now claiming. If the sodium content of the blood is dropping, it's because you're drinking too much water, not because you're sweating sodium! In fact, a very interesting study was published in 1992 by Robert Cade, the man who invented Gatorade. His experiment took place during a marathon, and the groups of runners were given Gatorade, 1/2 Gatorade (half water, half Gatorade), or water. The really interesting finding was that the water group maintained their sodium concentration (a surrogate for the total osmolality) just fine, while the Gatorade group actually increaesed its concentration. In fact this explains why people drink more of a sports drink compared to water---the sports drinks keep your osmolality higher and therefore makes you thirstier. So instead of lowering osmolality, which is what your body wants you to do, the sports drinks raise it. Seems kind of counter-intuitive, doesn't it? We hope it has become clear that, for a number of reasons, it is not necessary to drink so much during exercise, and in furthermore no one needs to tell you how much to drink. As we have shown you here, the thirst mechanism is highly sensitive and very successful at what it is meant to do: maintain your osmolality, not your weight. But the final message here is that when you drink to thirst, you optimize your fluid intake, and by that we mean your thirst will always keep you from drinking too much or too little. There is such a thing as both of those, but drinking to thirst will always prevent you from straying too far in one direction or the other. In addition, who wants to carry around three Liters of fluid in a backpack when half that volume will be just plenty? And when there is no scientific evidence to support the claims that dehydration increases your core temperature or elevates your risk for heat stroke, it seems quite unnecessary. In fact, the concept that people are "dehydrated" while losing a few kg's is now debatable. One last thing, is that as humans, we are regarded (by most, anyway) as the smartest animals, right? Yet for some reason, companies making fluids deem it necessary to inform you how much you should drink. Have you ever had to force your pet cat or dog to the water bowl? Have you ever seens signs in the wild pointing animals to the watering hole with instructions to drink before they're thirsty? Yet somehow, the Gatorades of the world have "discovered" the NEED to educate us all about fluid. It does strike one as patently ridiculous - thirst is good enough for every animal in the world, it's good enough for us...! We really hope you have enjoyed this series! Next week we will focus more on running again as we preview the USA Men's Olympic Marathon trials and the NYC Marathon. It will be a week of running-related posts, so be sure to join us for the discussion and analysis! In the last few weeks, we have run a series of posts investigating the events of the 30th Chicago Marathon, where record high temperatures caused the early cancellation of the race, amid record numbers of medical cases and emergencies. We discussed the possible cause of these collapses, suggesting that blood pressure and unfamiliarity with the heat were more likely the cause of the problems than dehydration and heat stroke, which were being blamed for all the problems. We also did a post looking at the sad death of Chad Schieber, a 35-year old policeman who collapsed at the 18 mile mark and was later pronounced dead. Initially, the death was blamed on the heat and dehydration, but the initial autopsy found that Schieber suffered from a relatively common condition known as mitral valve prolapse. This condition, which is reported to affect 2% o the US population, does not by itself cause death in athletes, but has been implicated as a contributing factor to a potentially fatal arrhythmia. Now, just over two weeks later, the medical examiner's office has released further reports that "tests show no evidence of dehydration." According to Nancy Jones, the Cook County Chief Medical Examiner, dehydration can now be ruled out. In response to our initial post on this death, where we suggested that it would be prudent and wise to hold the verdict until the autopsy result was announced, a few medical doctors wrote in saying that dehydration may contribute to the death. A few things in response - firstly, there's no evidence for that, it's pure supposition, because until one has actually studied the physiological response of people with mitral valve prolapse to graded dehydration DURING exercise (very important - it must be measured during exercise, as we've tried to emphasize in other posts recently), it's supposition to say that "dehydration contributed to the death". But in this latest news, what are referred to as "dehydration tests" (presumably measures of body water) have confirmed this. Again, there's an issue around what constitutes "dehydration" - is it 1% body weight loss, is it a change in total body water of "X" %? That's unclear. But it does seem more and more that it was not a dehydration issue. "You can actually see the University of Illinois at Chicago Hospital from where Schieber collapsed. It takes a minute and a half to get there. But the ambulance took between 8 1/2 and 14 minutes." But this does make me think back to the Comrades Marathon this year, where a runner collapsed perhaps 300m from the finish line. His fellow runners, seeing him lying there without medical support, picked him up and carried him across the line. Sadly, he was pronounced dead at the scene. But then even worse for all those involved, the runners who had attempted to help him were accused of contributing to his death! There was some physiological basis for this (you can read this in a post we did on it here), but it was a shame to have to play that game at such a time, in such a public forum. The death of Chad Schieber seems the same. To wrap up on a related theme, we're very much into the thick of our series on Fluid Intake and Dehydration: Exploding the myths. We've recently looked at the comparison between laboratory and field studies, having previously explained how it was the advent of "science" into marketing that drove a good deal of research in lab studies. In Post IV of that series, we'll look at the physiology of thirst and what the body is actually defending, as we ask the question: "Is thirst enough and how does it work?" So do join us for the completion of that series. In other news, the New York City Marathon takes place on the first weekend in November, and many runners are no doubt hoping for much cooler temperatures. Regardless of what happens, you'll be able to read all the race insights and stories right here! Despite this fact, from real athletes competing in real events, many scientific articles and lay magazines continue to emphasize that "dehydration" of this magnitude (2-5% of the pre-race weight) is detrimental to health and or performance. This is the basis for the many advertisements proclaiming the importance of drinking to runners, as we discussed in Post I of this series. Another important aspect of all of the field studies that have measured the post-race rectal temperature is that 39-41 C is quite a regular (and normal) finding. In 13 different field studies we have reviewed, the range of post-race core temperatures was 37-41.7 C. The one study that included untrained or lesser trained runners was the one that reported the lowest temperature---37 C in a group of 63 marathon finishers. 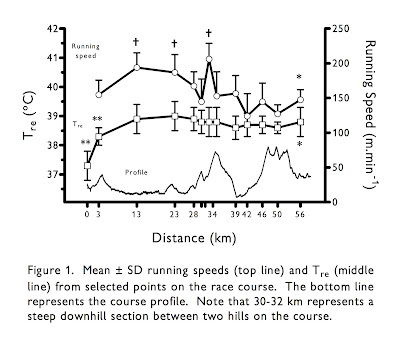 Nearly all the other studies measured highly-trained runners finishing marathons in 2:30 - 2:45. However what this aspect does represent is a limitation to how these studies can be applied. In other words, we cannot take those findings and apply them to the normal exercising population because running at exactly the same running speed for 2-3 hours is simply not how people complete marathons. Instead, they alter their running speed---that is, they slow down--- as they become fatigued or as their brain senses that they might get too hot. And this has a profound effect on their core temperature. Namely, it ceases to rise or even falls if they slow down enough. In our most recent post, we discussed the Rugby World Cup final, won 15-6 by South Africa. South Africa dominated the set pieces, particularly the lineout, and defended brilliantly to see out a tight match and claim a well-deserved victory. We've already done the post-match analysis, and besides, rugby is not our "core business" here on the Science of Sports, we prefer running and cycling! So we'll leave well enough alone and allow the rugby writers and former players to weigh in on this post match dissection. But one thing that I had to write about, because it's a pet hate of mine, is the quality of the South African commentary that we are subjected here in South Africa. We have a channel called Supersport, who get the most exceptional coverage of world sport. But their commentators are, in my opinion, letting the brand down. It's long been an irritation of mine, and I really do feel it is a telling indictment on South African sport. Yet it is not unique to rugby, I recall once listening to TV coverage of the Boston Marathon, with a pair of South African experts telling the nation that "these men are fast" for about 2 hours and 10 minutes. It was embarassing to be reminded how fast the winners were running, while breaks were going off the front, pre-race favourites were being dropped, but all we needed to know was that the men were fast. And here at the Science of Sports, we're focused mainly on science and performance analysis. But one of us (Ross) is also involved in the sports business and management industry, working in sports sponsorship and event creation, and so the management, commercialization and media coverage of sport is another key area, close to our interests. And commentary is one such area. Tonight's game saw (or heard, as the case is) a pair of SA commentators in Hugh Bladen and Garth Wright at the stadium. We needn't have had a referee because Garth Wright in particular dedicated himself to refereeing the match from the commentary box. And remarkably, it was only England who seemed to commit offences. Every tackle, every breakdown, England should have been penalised. If it had been believable, there'd have been 6 yellow cards all to England. Wright took great pleasure in informing us that the crowd could jeer all they wanted, because "from the pictures I'm looking at, there's only one decision here". Now, for our readers in the rest of the world, one thing you must realise is that when it comes to rugby, the South African male is never incorrect. This is probably a ubiquitous feature of world sport, though, and the same probably goes for England, Australia, New Zealand, any country. A Dallas Cowboys fan is probably the same. And that's fine, because sport is meant to create passion and excitement, and of course a fan will feel that referee is biased, the opposition is cheating and his team can do no wrong. The problem is that these people should not be in the commentary box. And if they are, then they should at the very least have the professionalism to restrain themselves from screaming out "Go Bakkies you biscuit! ", and "Frans Steyn, what a boytjie!" when the team scores points or performs well. To hear Hugh Bladen break into song at every turnover, with Garth Wright sniping around the fringes with his unwavering refereeing decisions is not professional, it's disgraceful. Now, Hugh Bladen and Garth Wright are South African fixtures, icons of our rugby fraternity (a word I use deliberately). So I'm sure many will disagree with my perception. Unfortunately, that the general public enjoy this commentary does not add to the global perception of South Africans. I once questioned Supersport about their running commentators and was informed that most of the public quite enjoyed the 'expertise'. That is to say, they found it stimulating to be told over and over that "these men are fast", while the real race was developing in silence on the TV screen. But we are fortunate enough in South Africa to receive a weekly rugby discussion show from Australia and New Zealand. And frankly, the difference between the level of insight provided by the Australian and Kiwi rugby experts and our own is embarassing. So too, I often catch the last hour of the NFL Monday Night Football coverage on ESPN, and the level of coverage provided by the USA commentators is remarkable - professional and polished. So let's take this world title, and use our players as the inspiration to spend the next four years unearthing commentators who are professional ambassadors we can be proud of, as our rugby team have proved to be. RWC 2007: South Africa 15 - England 6: SA World Champions! South Africa are the Rugby World Champions for a second time! They won tonight's final against a spirited but sterile England side who probably outdid themselves even reaching the final. But the reality is that South Africa were never really challenged and by big final standards, won the game relatively easily. In our previous post, we predicted 20-9 as the winning score for South Africa. It was 15-6, five penalties to two, and a fair reflection of the game, as it turned out. The game went very much according to plan (for SA, that is). 80 minutes of sporadic kicking, which was at times very aimless, made for a fragmented game. As finals tend to be, this one was tight, and I can recall about three line breaks in the entire match, but not one resulted in a try. For England, it was a bridge too far, though many would have thought the same when they'd made the semi-final. But they simply had no firepower. Their tactics were a little perplexing, because it was quite apparent that they would not breach the South African line, even in another 80 minutes. They used Wilkinson as a ball distributor, standing so far in the pocket that the Springbok defence were never even stretched. Play moved from one side of the field to the other, but they never looked threatening. They did create the best chance of the game, when Matthew Tait broke through and Mark Cueto was denied a try by a blade of grass and a foot that just scraped the touchline as he dived for the corner. It was the only time England threatened a try. Yet despite this apparent ineffective attack, they seemed dead-set against using Wilkinson to keep in touch with SA using the drop goal method. There were easily five opportunities for England to set up a drop goal attempt in the second half - the one occasion they did, it went wrong, and they didn't go back to that method again. Their willingness to run the ball, later forced by their deficit, was to their credit, but as noted, there was just no penetration in their attack. Wilkinson's kicking from hand was ordinary, lacking distance and accuracy. South Africa won the kicking contest hands down. They could afford to kick for touch, knowing that their towering lineout would pressure the English and win the ball back more often than not. They did not have the expected dominance in the scrums, and at the breakdown, couldn't force the penalties they eventually needed if they were going to win the match. All in all, brave, a performance to take pride in, but just not sharp enough. The South African game was disciplined, efficient and clinical. The lineouts were magnificent, and Matfield and Botha put so much pressure on England that the stakes in the kicking game were raised for England. The composure and discipline was also commendable. At every tackle situation, the South Africans were patient and controlled, giving away only one penalty in the entire game. A big reason for this was that the England hadn't shown the level of penetration that might force South Africa to slow the ball down at the breakdown. This afforded South Africa the opportunity of playing a safer game in defence, and the result was only two shots on goal for Wilkinson. Brian Ashton has just been interviewed and feels that his team were not outplayed. I'm not sure which game he was watching - the lineouts, the kicking game, tackling, all won by South Africa. England had more of the ball, but that's about it. The South African defence seems to hunt not in pairs, but in threes. South Africa did, in fact, miss more tackles than England. But there was always backup, and backup to the backup, and England pounded and pounded away, but barely chipped the surface. They also made substantially more tackles, a trend in this tournament - the team that has less of the ball wins, as we wrote earlier today. Then finally, South Africa were fantastic under the high ball. It was an England tactic to launch the ball high, but I recall only one occasion where they regained possession. South Africa were safe and secure under almost every ball, negating another of England's attempts to breach the defence. So Jake White's 4-year plan is realised, and should he depart, as seems likely, he'll have had the last laugh, because South Africa's rugby future may soon be decided by political forces (more than usual, that is!). One thing that winning does is preserve the status quo a little longer, and so perhaps the political wolves clamouring at the door may have to wait a little longer. So South Africa will wear the crown of World Champions for four years, until New Zealand 2007. These four years may prove the most tumultuous in the history of South African rugby, with promises of political 'influence' (read interference) over rugby, and the lure of the Euro and Pound attracting more and more players to France and England. So SA Rugby has a task on its hand. It is my experience of SA sport that we are the "worst winners" in sport, often failing to take lessons from victory and build on them. So the challenge is there moving forward, it will be fascinating to see how the incoming management achieve this. But for now, little thought of planning, I'm sure. Instead, it will be all about celebrating the title of World Champions! 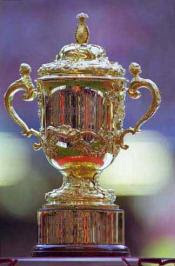 In a little under six hours, South Africa and England will clash in Paris in the final of the Rugby World Cup 2007. We've left the tournament a little untouched so far, apart from our analysis of the shock exit of the pre-tournament favourites, New Zealand. Once the All Blacks had been eliminated, the collective focus on the tournament turned to South Africa, who had looked effective and efficient in moving through to the semi-finals. There were a few scares, notably a close shave against Tonga (with a weakened side, admittedly), and a 10-minute period against Fiji where rugby was played as I wish it always was. But they came through, and results in other matches have seemingly gone South Africa's way, leaving 80 minutes between Jake White's team and the Webb Ellis trophy. Rugby fever has gripped South Africa and, no doubt, England. Every second car here in Cape Town has an SA flag flying from its aerial, two out of three people are wearing some kind of national colours (green and gold) and complete strangers are wishing one another well as they pass in the streets! A friend of mine was commenting last night how great it is as a unifying force - she was right. But that is far from the minds of the 30 men who'll take the field tonight. If anyone had predicted this final - SA vs England - after the second week of the tournament, they'd have been laughed off as a rugby lunatic. South Africa destroyed England, 36-0, and it seemed that even Tonga would have a realistic chance of beating the defending champions. But somehow, England recovered, and have won their remaining matches, including one against Australia and a semi-final against France. Both have come courtesy huge performances from their forward pack and the surgically efficient boot of Jonny Wilkinson. That would seem to be South Africa's only concern today - control the forward play and deny Wilkinson the opportunity to win the game at the end. For one thing that is for sure, England do not seem to possess the firepower to challenge South Africa. In fact, this England side are much like South Africa of 3 or 4 years ago - solid and strong, well-organized, but a distinct lack of penetration. That has now changed for SA rugby, and the pressure we have learned to create through defence has produced numerous tries in this tournament. Let's make no mistake - defence wins the World Cup. In South Africa's big victory over a tired looking Argentina in the semi-final, it was pressure and forced turnovers that produced four out of five tries - an intercept, a turnover, a forced error by the flyhalf and another intercept - 20 points in the bag. The intense pressure that is applied to the team who carry the ball is responsible for proabably 70% of the tries in the tournament. And in particular, South Africa have mastered this ability, with fast hands and even faster runners to capitalize on disorganized defence when that turnover comes. Jake White and South Africa have perfected the art of winning the game without needing the ball. There was a time where the objective of rugby was to hold onto the ball, carry it through phases and work the opposition defence out. That is no longer the case. In fact, I would dare say that in the current game, the team that has the ball is the one that is at a disadvantage! Therefore, the objective of the game (as will be demonstrated tonight, I have no doubt) is to give the opposition the ball and then force the turnovers. For from turnovers, tries result, when the team is geared towards it. In terms of science or statistics, one need only look at the numbers. When South Africa beat England 36-0, we had only 40% of the ball. Butch James, playing at flyhalf, passed the ball a grand total of zero times from first phase possession! Instead, it's kick for territory, give the opposition the ball (60% of it) and then tackle them, subdue them, and force an error. Then move it into space and score tries. And South Africa have done this magnificently. Last night, Argentina did the same to France. Argentina had only 35% of the ball, and made 113 tackles compared to France's 50. So it's quite clear who was playing the game with the ball. But unfortunately for France, they made crucial mistakes - kicks that failed to find space or touch, turnovers through errors, forced turnovers, and Argentina scored three tries from rapid use of turnover ball. The final score - 34-10 to Argentina - little reward for France's possession. But for tonight, rule changes are far from the minds of the players. South Africa have executed this strategy (call it subdue and penetrate) magnificently and are certainly the favourites for the title. In fact, I would go so far as to say that I would give England a 15-point head start and still back SA to win. But finals are great levellers and so anything can happen. But with South Africa's firepower, and ability to pressure the opposition through defence, one can't see England scoring more than a handful of penalties or drop-goal. South Africa, on the other hand are filled with potential match-winners and try-scorers. It probably won't be the sort of game that brings tries, though. Perhaps an intercept, charged down kick or careless knock on will be pounced on and scored from. But it's South Africa who seem more likely to do that. In terms of negating the effect of Wilkinson, the key is to deny England first phase possession. That means holding your own in the scrums, and controlling the lineouts. The South African lineout, best in the world, should have the edge in this area, and so that affords SA's kickers with ample opportunity to do what teams seem to do best - kick the cover off the ball, gain territory and then pressure England and deny Wilkinson. Brendan Ventre recently wrote an excellent article for a local paper in which he bemoaned the state of the current game. He said then that the most important thing to do to win games is dominate set pieces, and that will probably win tonight's for SA. Wilkinson and the England squad will have other ideas. Let's hope it's a great ad for the game! Today sees the second post in our series on fluid intake, dehydration and exercise. Yesterday we looked at the history of fluid intake and how radically our beliefs on the subject had changed. Today we turn our attention to the evidence that has accompanied this shift, beginning with the contention that runners who become dehydrated are likely to develop heat stroke. If you examine the scientific literature before the 1960's, you will not find much research on how fluid ingestion affects temperature regulation. The earliest thermoregulation study we know of is from 1938 and was performed by Marius Nielsen in Copenhagen. The title was, "Die Regulation der Korpertemperatur bei Muskelarbiet," which in English translates as "The regulation of the body temperature during muscular work." Nielsen performed an exhaustive series of experiments on several men, in which he demonstrated 1) the core temperature goes up as you exercise at higher power outputs and therefore exercise intensities; and 2) the core temperature is regulated at a higher level during exercise. In fact one figure shows that during a four-hour exercise bout at 180 Watts, the rectal temperature is maintained at about 38 C for the duration of the exercise. "The central body temperature of a man rises gradually during the first half hour of a period of work to a higher level and this level is precisely maintained until the work is stopped...During prolonged work the temperature regulatory center in the hypothalamus appears to be reset at a level which is proportional to the intensity of the work and this setting is independent of environmental temperature changes ranging from cold to moderately warm." Robinson's paper agreed with the findings of Nielsen---namely, that the core temperature during exercise is regulated at a higher level during exercise. This was precisely our point in our "When abnormal is normal" post: the body is quite happy with change during exercise, and many variables are regulated at different (higher) levels during exercise without any problems. In addition, these scientists showed that the metabolic rate is the thing that determines your temperature. In other words, the harder you exercise the hotter you get. Up until this point, little mention was made of fluid - it was all about work rate. In 1970, Professor David Costill published the first lab study that investigated the effects of fluid ingestion on temperature regulation. In that experiment the main finding was that when the runners drank no fluid, their temperatures were higher at the end of the two-hour run, and therefore a relationship between the volume of fluid ingested and the rise in core temperature was established. Several other studies together with this one, then, appear to have shifted the paradigm. Gone was the idea that metabolic rate predicted the rectal temperature, and in its place came the concept that the level of dehydration was responsible for driving the temperature higher during exercise. We now move into the 1990's, which saw a more robust and detailed repeat of Costill's 1970 study. In this one, published in 1992, the cyclists were made to cycle on a bicycle in a laboratory for two hours, while drinking different volumes of fluid. The title of this study says it all: "The influence of graded dehydration on hyperthermia and cardiovascular drift during exercise." The main finding, which is shown in the graph above (click to enlarge it) is that when the subjects drank no fluid (NF - the open circles) they had the highest rectal temperature, and when they drank more (LF - the solid circles), their temperatures were lower. So then it is case closed? Two very good lab studies, published by very well known and respected Exercise Physiologists, seem to show very clearly that ingesting more fluid keeps your body cooler. The studies were well-controlled and the data are robust, right? Good science - but can it be applied to YOU? Well, yes, they were well-controlled and experimentally sound. However both of these studies have major limitations to the manner in which they can be applied, and here is why. First, the wind speeds that were moving over the runners and cyclists were not anything like what they would experience when exercising outside. The effect of convective cooling is substantial. We won't go into the physics of the equations, but we can tell you that if you do a mathematical model, you discover that a change in wind speed of only 1km/h can change body temperature by more than 2 degrees Celsius over the course of a two hour trial. Now, if you take a study like that of Coyle's, where the small fan provided wind speeds of 9km/h, then you can see how vast the difference would be if the windspeed was just a little higher, let alone the realistic 30km/h! Therefore, while these studies showed clearly an effect, it is arguable that this small effect was amplified by the lack of wind speed in these trials. Even in these two trials the differences in core temperature at the end of the two hours of exercise was less than 1 C. Even more important, the peak temperature were what we would call "normal" as they were only ~39 C. Even more still, the authors of these studies, although claiming the effects of dehydration on temperature, did not report that any of their subjects suffered any ill effects from not ingesting fluid, and they reported no signs or symptoms of any kind of "heat illness" after the exercise trials. So does it come as any surprise that the 1992 study above was, and we quote, "supported by a grant from the Gatorade Sports Science Institue?" The workload in these studies was fixed, and the subjects were not allowed to pace themselves as they are in a real race situation. The last point above is yet another limitation to how these studies are applied. . .however we will leave it at that for now as this post already is very lengthy---remember that we wrote theses on these topics! So to condense the concepts down into one post is a real challenge. Be sure to keep coming back for the next post in this series, where we will show you the real effects of dehydration on cycling performance and temperature regulation!